Whether you plan to drive on paved streets or go off-road, we can’t stress enough the importance of your wheels and tires. 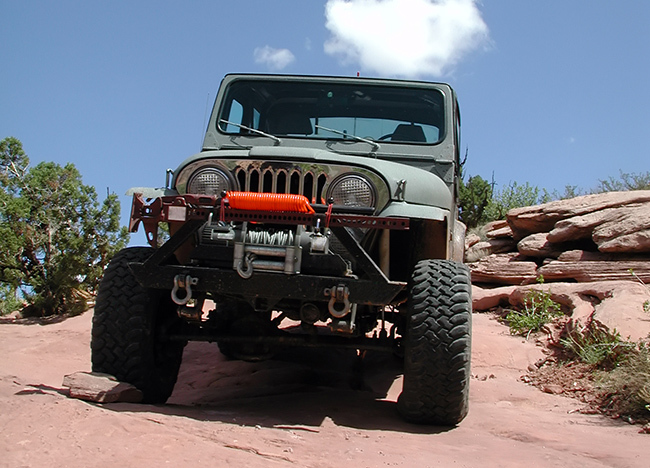 Their size and form will affect your Jeep’s performance in many ways. The condition of your tires is also crucial to maintaining the integrity of your rig. The terrain you plan to navigate also needs to be taken into consideration. Depending on the model you drive, tires sizes can vary. However, generally speaking, when it comes to the standard factory size, the Wrangler come with 15"-17" tires. The first set of numbers (255) refers to the tire width in millimeters. The next set of numbers (75) is the sidewall aspect ratio, a percentage that tells us how tall and narrow the sidewall of the tire is in millimeters. The next part of the number system describes the tire’s internal construction, in this case, ‘Radial.’ The other option is “B” for Bias Ply used on some truck types. The last two digits in the system (17) represent the tire’s wheel diameter in inches. Additionally, if tires are being referred to in inches, the measurement will read 33x12.50R15. The first number (33) refers to the full-length diameter of the tire in inches, from the ground to the top of the tire. The next number (12.50) will be the width of the tire in inches. The last number (15) is the rim’s diameter in inches. That being said, all models will accept upgraded or up-sized tires, thereby improving overall vehicle performance and capability. Changing the tire size can increase ground clearance, improve traction, impact fuel efficiency and overall vehicle health. Great for occasional off-roaders, those who drive primarily around town. Most Jeeps will need a leveling, lift kit or some type of modification to accommodate tires of this size. A lift kit will act as an aesthetic effect as well as a practical one. These tires require a 2.5"-3" lift kit. They’ll continue to work well on both paved roads and trails. Take your Jeep to the next level. This is the point where you’re looking at gear changes to compensate for power and fuel mileage lost due to larger, heavier tires. This size tire requires a 4" lift for off-road use as a 3" lift will likely be too tight. Regardless, when you get off-road, these tires will perform nicely. This size provides an extra inch in height and goes up to 14.50" in tire width (38x14.50R17). The 38" tires are hard to turn, and you’ll need some horsepower behind them. Again, they’re great for off-road use, but not good for commuters. These tires can’t be beat for off-road use. The extra height turns obstacles into simple non-events. When considering clearance issues, you’ll need at least a 6" lift unless you do some major body modifications to make them fit properly. How long will Jeep tires last? Much like the impact of tire size, the condition of your tire will impact its performance. Stock tires with minimal wear and tear will get anywhere from 50-60k miles. However, those numbers can change quickly if you do a significant amount of off-roading. On the other hand, if you’re mainly a freeway driver, your tires will last longer. Investing in quality tires isn’t cheap, but in the long run, repair or replacement is far more expensive. You may need to replace your tires because of issues with alignment, suspension, tire balance, or chunking/chipping that comes with off-road use. Where will you drive your Jeep? Jeeps generally come standard with all-terrain or mud-terrain tires. Whether you choose all terrain or mud terrain tires depends on how and where you’ll be driving. These types of tires are designed for on- and off-road use. Most offer a mileage warranty between 40-60K miles and some have a 3-Peak Snow Flake rating for winter driving. With aggressive tread patterns and larger lugs, these tires offer extraordinary gripping power in all kinds of off-highway terrain, especially wet snow and mud. They are also extremely durable, with super-tough sidewalls to absorb the impact of rocks and other off-road hazards. If you drive in areas that get lots of the white stuff, these are the tires for you. Winter tires stay soft and pliant even in subzero temperatures. They also have a number of grooves and channels, called sipes, in the tire tread. Sipes bite into wet snow and ice to improve traction in slippery conditions. Available for vehicles and ATVs that hit the dunes. Sand tires feature either horizontal or V-angled paddles, or extrusions, that churn sand and deliver superior traction. Most serious off-road enthusiasts “air down,” or reduce the air pressure in their tires before they hit the trails. Doing this increases the amount of tire surface that touches the road improving traction. Just remember to air back up before you drive on pavement. Driving at highway speeds on low tires is bad for your tires and can be dangerous. Knowing how and where you plan to use your tires as well as getting familiar with various tire sizes will narrow down your options. However, you can rest assured there’s a solution that’s right for you and your Jeep. We have a great selection of tires at TireBuyer plus fast and free delivery to a local installer. Shop for tires now or if you need help selecting the right tire, give our tire and wheel experts a call at (866) 961-8668.